We’ve homeschooled through a few small disasters. Last year Curly was hospitalized with appendicitis and a surgery followed the next day. We moved twice last year. That’s a crisis in and of itself. I was hospitalized twice while pregnant with Punkin. We’ve had a few major sicknesses hit too. So, how to do keep on keepin’ on? Sometimes you just don’t. It’s ok to take a break. We homeschool to be flexible. We homeschool to make school part of our family and family always comes first. For those of us who are Type A, this is a hard reality. Sometimes you just can’t keep going and that’s ok. You can pick back up later. You can focus on life lessons and teach character and some important survival skills. Life will calm one day and things can carry on, even if it’s within a new version of normal. Sometimes you really can’t take a break. Sometimes you have to change your plans. You have to be flexible and adapt. You might have to make some curricula changes. Computer-based learning might become a necessity. You might need to outsource and find some help, a co-op, or a tutor. You might have to take an entire semester off and pick up in the summer. Or maybe you have to school only in the evening when your spouse is home. Life happens and you have to be able to cut yourself some slack. Here are a few things that kept me going when the craziness was closing in on me. Computer programs – there are some awesome computer-based learning programs out there. Reading Eggs literally saved my life this summer while we were stuck in a corporate apartment, house-hunting, knowing no-one, and being hit with one sickness after another. I keep a little file of the computer based programs available just in case I need to get started on one. DVD’s – Sometimes you have to declare a movie day. There’s nothing wrong with that. The Magic School Bus and What’s in the Bible? are my very best friends! We have a stash of nature DVD’s and we netlix IMAX films. A little education for them and a lot of a break for me! Field trips – When we were in the middle of some stressful situations, we took a break from our regularly scheduled programming and took some field trips. This past summer I went to SeaWorld once or twice a week. I saw the Azul show every. single. week this past summer. I could live a thousand years and never see it again. But the kids begged for it and my sanity was saved as I got out and took a break from the stress of moving. The boxes will always be there (and some of them still are, actually)! Read Alouds – I have a huge stash of books. I actually have a terrible problem! I hoard books! We have shelves full of wonderful books to read. When nothing else gets done we read. I don’t have to make library trips and drag books all over town. I just climb on my step stool and reach high into the top shelf and pull out a gem that we haven’t read in a while and we cuddle together and read and read and read. File boxes – These little portable plastic filing boxes have been a lifesaver! I have one file box per kiddo. In each box, I put all the books for that week. When we needed to do school on the go, I just grab my boxes and I’ve got most subjects for that week crammed in there. And when we moved, I put two months worth of things in a giant storage tub and that was our school. We pulled out our books, paper, and pencils and went to work. The tub was our storage spot and doubled as our desk. It wasn’t pretty but we got it done! So, you can take a break or you can keep on going. But whatever you decide is best under the circumstances, cut yourself some slack and extend yourself some grace. God’s pouring that grace down on your family in the midst of the crisis, just make sure you give some to yourself. 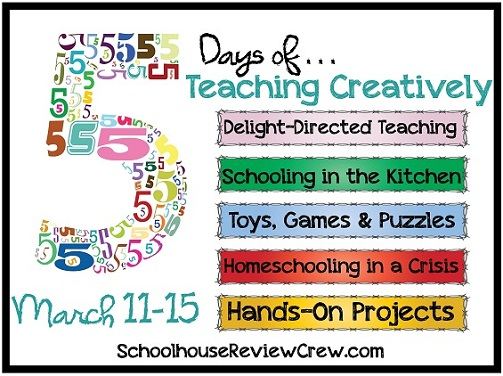 How does the Crew homeschool through crisis? Read it on the blog! I like the file box idea. Seems a bit tidier than our current overflowing basket.